Finance Minister Piyush Goyal said the government is confident of sticking to the fiscal consolidation roadmap as high growth will help in raising tax revenues. The government is estimated to spend Rs 20,000 crore for income support scheme to farmers for four months this year. Higher expenses on account of income support for farmers and income-tax relief for the middle class has come at a cost to the government, which has missed achieving the fiscal deficit target for the second year in a row. The government will contain the fiscal deficit target at 3.4 per cent of gross domestic product (GDP) for the current year as per the Revised Estimates, against the Budget Estimates of 3.3 per cent. The government is estimated to spend Rs 20,000 crore for income support scheme to farmers for four months this year. It will cost Rs 75,000 crore for next year. Tax rebate for people with taxable income up to Rs 5 lakh will cost another Rs 18,500 crore next year. The measures to boost consumption in the Budget are expected to push growth next year, helping the Centre in improving its finances going forward. Issuance of recapitalization bonds financed record equity infusion in public sector banks preventing in any higher slippage of fiscal deficit targets. This happens since the government needs to account only the interest payments on recapitalisation bonds on the books. While tax projections for the upcoming financial year have been kept at realistic rates, the government has pegged disinvestment receipts at an ambitious Rs 90,000 crore for the next year. For the current financial year so far, the government has raised Rs 35,532.66 crore as disinvestment proceeds out of the target of Rs 80,000 crore. Buybacks of shares by state-owned companies, and sale of government equity in same sector companies (such as Power Finance Corporation acquiring government stake in Rural Electrification Corporation) would help the government in achieving the current year target. Revenue from direct taxes are estimated to exceed the initial budget target by Rs 50,000 crore to Rs 12 lakh crore in 2018-19. Customs revenue mop-up is also estimated to be higher than the Budget estimate by Rs 17,538 crore at Rs 1.30 lakh crore. But the goods and services tax (GST) collections have fallen short of the budget target by Rs 1 lakh crore, with revised estimate for 2018-19 pegged at Rs 6.44 lakh crore. “A lot of the growth that was not captured in the GDP numbers that had come out earlier. Because the nation is rapidly moving towards more formalisation and you would have observed that as the nation move toward formalisation, tax revenues are going up, tax base is going up. Probably, it has taken some time for that to come into the system in terms of calculations, but as more and more calculations are becoming robust, I am quite confident that given the new numbers that are coming out, the fiscal roadmap may not change very much,” he said at a press conference after presentation of the interim Budget 2019-20. Fiscal deficit will be mainly financed through net market borrowings Rs 4.48 lakh crore in 2019-20. As per the Revised Estimates, the net market borrowing for the current fiscal was raised to Rs 4.47 lakh crore against the Budget Estimate of Rs 4.07 lakh crore. Increasing fiscal deficit will push up government’s interest payments on servicing of the loans. Interest payments, which constitute the largest component of Centre’s revenue expenditure, is expected to rise to Rs 6,65,061 crore in Budget Estimate 2019-20 or 33.6 per cent of revenue receipts, up from Rs 5,87,570 crore in Revised Estimate 2018-19 or about 34 per cent of revenue receipts. Congress criticised the government for weakening fiscal stability. “The big takeaway is that the present government has further weakened fiscal stability. 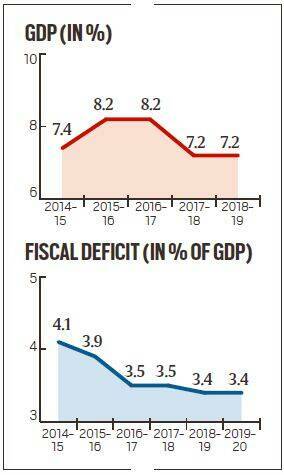 For the second year in succession the government has missed the fiscal deficit target. The revised estimate shows a slippage from 3.3 per cent to 3.4 per cent. Worse, for 2019-20 too, the government has proposed an FD of 3.4 per cent. The government has thrown the FRBM (Fiscal Responsibility and Budget Management) Act out of the window,” Former finance minister P Chidambaram said. “Similarly, the government will end the year with a Current Account Deficit of 2.5 per cent as against the CAD in the previous year of 1.9 per cent. Both numbers for the current year and the estimate of FD for 2019-20 point to incompetent fiscal management and a disdain for fiscal prudence,” he said. Another major component of expenditure, subsidies are estimated to increase slightly from Rs 2,66,206 crore in RE 2018-19 to Rs 2,96,684 crore in BE 2019-20 — an increase of 11.4 per cent. As a percentage of GDP, the amount spent on subsidies remains unchanged at 1.4 per cent.